The Soilmec SM-4 is a compact drilling machine featuring a separate power pack for restricted access drilling. It has two different engine sizes available: 115 kW and 110 kW (diesel and electric). The hose length from the power pack to the rig can be up to 50m length, giving more flexibility and minimising the size of the rig unit to 740mm width enabling access to the most restricted jobsites. Among the many features the most interesting is certainly the telescopic low head room mast, with a powerful 70kN extraction force with a mast stroke of 1500-2500mm. 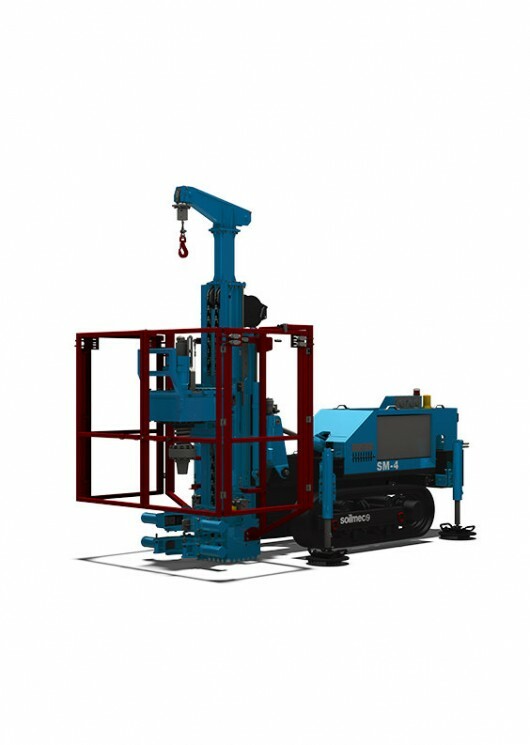 The rig is suitable for up to 600 mm diameters auger drilling in 1m or 2m length sections. The high torque rotary head has 33kNm maximum torque with the ability for 4” concrete injection through the head due to the large swivel and swan neck.